LG shows off its super-thin TVs. They will cost a bit more than a penny, though! LG has decided to show that it's not just OLED-toting TVs that can offer up super thin displays, with the announcement of the world's slimmest-ever 42-inch and 46-inch range. The LG screens are a mere 5.9mm thick. To put this into perspective – Sony's XEL-1 OLED TV (the only one currently on the market) is half the thickness of the new TVs, at just 3mm, but that screen is just 11-inches in size. So for LG to pack so much tech in a thickness that's just a quarter of an inch in size is mighty impressive. The HDTVs use LGS (Light Guide Sheet) technology to shrink the thickness of the screens, which also reduces the weight – the sets weigh in at 6.1kg and 7.3kg. Footage on the screen should be smooth as 120Hz tech is in place to stop motion blur and being thinner means less power is consumed. 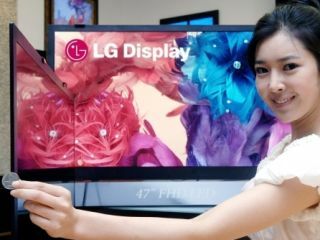 The panels aren't quite LED backlit, but LG is said to be working on this, instead they are LED edge-lit. Price and availability is still to be confirmed, but what is known is TechRadar's excitement for the sets is turned right up to 11.